The original oils on canvas painting has been sold. 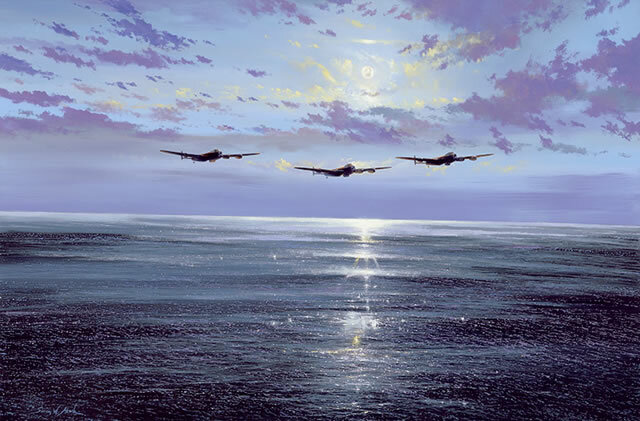 Capturing the last serene moment for Dambusters Gibson, Martin (L) and Hopgood (R), the quiet bravery of 617 Squadron aircrew and Gibson’s brilliant leadership. This painting is inspired by the famous film The Dambusters starring Richard Todd and by the accounts of the raid in Guy Gibson’s book “Enemy Coast Ahead” and Paul Brickhill’s “The Dambusters”. 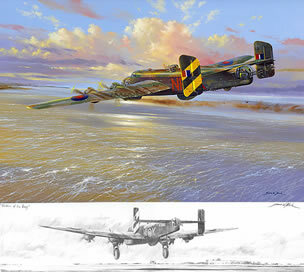 Both accounts describe, vividly, the crossing of the North Sea under a bright moonlit sky of fleeting cloud as Gibson (centre Lancaster) led his formation of Hopgood’s Lancaster (to right in the painting) and “Mick” Martin’s crew (to left), as they chased down the sparkling moonlight on the calm surface. It must have been a quiet, reflective time for all 21 aircrew aboard the three Lancasters as they neared the coast of occupied Europe. What would the flak be like ahead, en route to the target? Would skimming a 5-ton bomb along a reservoir knock down a huge dam? 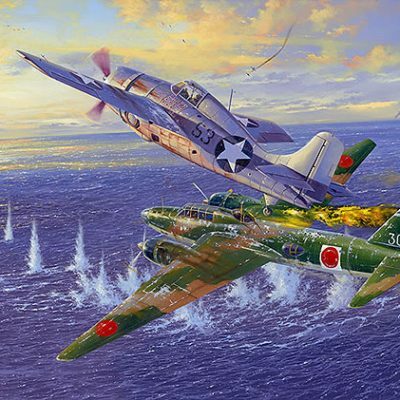 Then the Navigators radioed the fateful words “Enemy coast ahead Skipper” and the throttles opened wider to spread the three aircraft further apart to make it harder for German flak to concentrate on a single target. The aircraft accelerated into the climb and up over the headland point. On, ever deeper into enemy held territory; no real idea just what was waiting for them when they reached their target…if they actually got there intact. I wanted to capture the atmosphere these young lads must have felt before meeting the occupied European mainland and the enemy’s defences. Whatever the raid accomplished, that is not what this painting is about. It’s about Guy Gibson’s brilliant leadership – he was just 24 years old when he led this attack- and the courage and tenacity of young boys turned into men. This scene is just as the crossing of the North Sea was described by those who flew the raid. The Dambusters raid has been painted many times before and I cannot add anything new that has not been already been done regarding the actual attacks. But I hope this quiet, serene moment of calm, of steady courage before the storm of all hell breaking loose at the target Mohne Dam says something of the quiet bravery of these incredible aircrew of 617 Sqn. that all the other paintings have missed. Flt Lt J. V. Hopgood DFC & Bar would not return. He and 4 of his crew would be killed.